Spring is finally here, which means it’s time to take a look at some of the most exciting public art installations coming to New York this spring and summer. Last year, works like Lincoln Center’s “Hippo Ballerina” and Henry Taylor’s High Line-dominating self-portrait captured attention; this year, expect new pieces from talented artists, both local and worldwide, to turn heads. Here, we’ve collected more than a dozen worth scouting in the next few months, some of which are in place already. As more cool projects come to light, we’ll update the map—and as always, if you know of anything that we may have missed, let us know in the comments. In “Our Memories,” sculptor Judith Modrak has crafted seven interactive installations that recognize “the need to record one’s personal experience,” per its description. Visitors are asked to recall a “powerful memory” and then share it by depositing a color-coded stone into one of the sculptures. The colors correspond to six emotions: joy, anger, love, sadness, fear, and surprise. 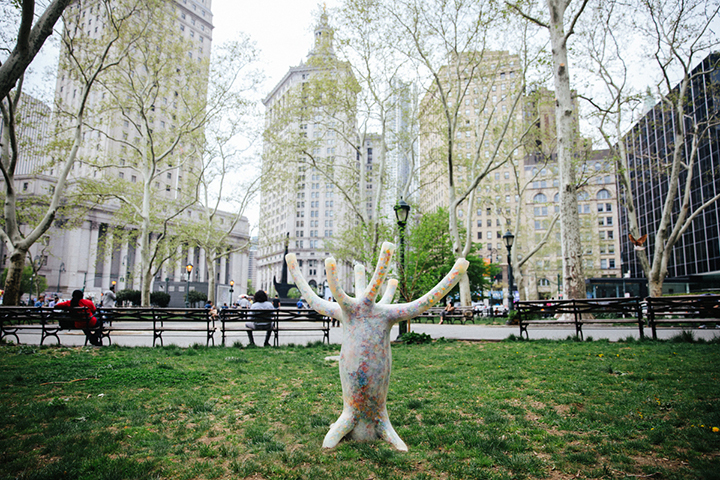 The sculptures will appear in lower Manhattan’s Thomas Paine Park for 10 months beginning in May, after a short stint in Central Park. This entry was posted in Press Release on May 25, 2018 by Marianna Peragallo.